Plastic flasks are used to grow viruses. For safety purposes, no glassware is used in the BSL4 laboratory. Determining how the virus grows and interacts with cells gives scientists more information about the mechanism of infection and ways in which we can target the viruses. 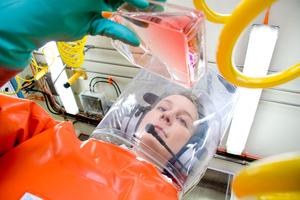 CSIRO scientists who undertake research with zoonotic viruses, such as Hendra virus and SARS, must work at Biosafety Level 4 (BSL4) - the highest biosecurity level. This requires scientists to wear fully encapsulated suits with their own air supply. AAHL provides a unique resource for Australia, and its capacity to work with deadly BSL4 disease agents is arguably the best in the world. Photographer : Frank Filippi on July 30 2009.